Choosing the proper Hotel or Apartment room is essential to establishing a good Mobile Office that allows the USB Modem for Internet to work. 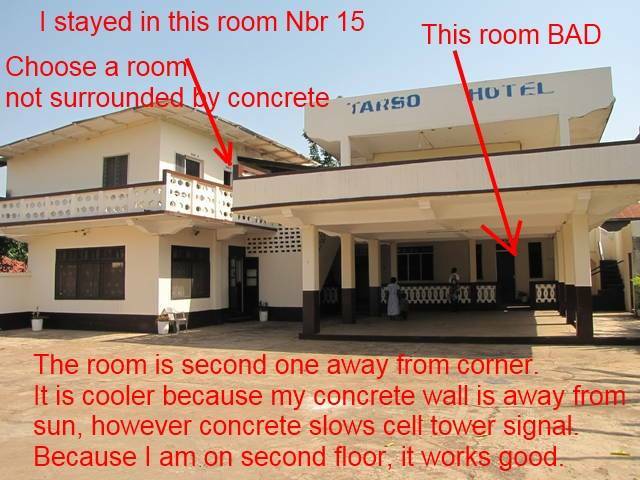 Here is a photo to help illustrate the problems encountered when setting up a Mobile Office in Ho, Ghana. I could have chosen a cheaper room on the bottom floor, however, I chose the upper floor to allow my BlackBerry Bold that is tethered to my computer to have a more powerful signal. There is a small battle here, the upper and bottoms room are not air conditioned. If you have a steel roof directly above your room, it creates a greenhouse effect. I have two windows, one on the front and one at the rear of the room. This allowed good cross flow ventilation. If I would have chosen the lower room, it would have been cooler, but then the signal would have been dodgy. The roof had a layer of wood under the steel roofing, and also a lowered ceiling in the room. This Hotel is constructed properly for best cooling, therefore my room is very comfortable. The overhead fan cools me great, however a floor fan would have been better because they do not dry out my eyes, because a floor fan can be pointed at my feet, and not directly at my eyes, while a ceiling fan blows directly at my eyes. In many rural areas the housing density is too low to make construction of a new base station commercially viable. In these cases it is unlikely that the service provider will do anything to improve reception, due to the high cost of erecting a new tower. As a result, the only way to obtain strong cell phone signal in these areas is usually to install a home cellular repeater. In flat rural areas the signal is unlikely to suffer from multipath interference, so will just be heavily attenuated by the distance. In these cases the installation of a cellular repeater will generally massively increase signal strength just due to the amplifier, even a great distance from the broadcast towers. Some construction materials very rapidly attenuate cell phone signal strength. Older buildings, such as churches, which use lead in their roofing material will very effectively block any signal. Any building which has a significant thickness of concrete or amount of metal used in its production will attenuate the signal. Concrete floors are often poured onto a metal pan which completely blocks most radio signals. Some solid foam insulation and some fiberglass insulation used in roofs or exterior walls has foil backing, which can reduce transmittance. Energy efficient windows and metal window screens are also very effective at blocking radio signals. Some materials have peaks in their absorption spectra which massively decrease signal strength. Large buildings, such as warehouses, hospitals and factories, often have no cellular reception further than a few meters from the outside wall. Low signal strength is also often the case in underground areas such as basements and in shops and restaurants located towards the centre of shopping malls. This is caused by both the fact that the signal is attenuated heavily as it enters the building and the interference as the signal is reflected by the objects inside the building. For this reason in these cases an external antenna is usually desirable. Even in urban areas which usually have strong cellular signals throughout, there are often dead zones caused by destructive interference of waves which have taken different paths (caused by the signal bouncing off buildings etc.) These usually have an area of a few blocks and will usually only affect one of the two frequency ranges used by cell phones. This is because the different wavelengths of the different frequencies interfere destructively at different points. Directional antennas are very helpful at overcoming this since they can be placed at points of constructive interference and aligned so as not to receive the destructive signal. See Multipath interference for more. The longer wavelengths have the advantage of being able to diffract to a greater degree so are less reliant on line of sight to obtain a good signal, but still attenuate significantly. Because the frequencies which cell phones use are too high to reflect off the ionosphere as shortwave radio waves do, cell phone waves cannot travel via the ionospohere. Repeaters are available for all the different GSM frequency bands, some repeaters will handle different types of network such as multi-mode GSM and UMTS repeaters however dual- and tri-band systems cost significantly more. Repeater systems are available for certain Satellite phone systems, allowing the satphones to be used indoors without a clear line of sight to the satellite.